Jewelleries have long been used by human beings to adorn themselves and show off their status in life. From as far back as the Egyptian period, the use of jewelleries as body adornment is practiced by not only the nobilities but also of the common people. From simple brass rings tied around the wrists and ankles up to gold plated earrings and headgears, the use of gemstone jewellery serves to close the gap between classes. 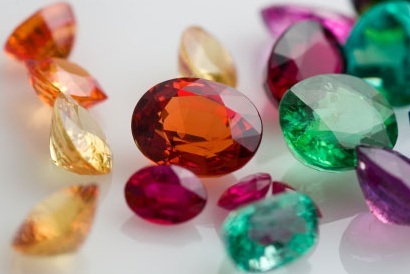 Popular gems used would include rubies, opal, emeralds as well as sapphires and even onyx and diamonds. Today, modern jewellery not only makes use of precious metals such as gold, silver and platinum but also other materials such as pearls, precious gemstones and even everyday items that can be found in one's kitchen homes. The evolution of jewelleries are usually influence by the current trends in the fashion industry as well as social beliefs of the society. Depending on the preference of the wearer, one can choose from many gemstones available. Popular choices would include one's own birthstone, which typically depends on the month that one is borned. Other trending choices include the use of rubies, emeralds, amethyst and even sapphire as well as huge chunks of semiprecious stones mixed together by designers or jewellers. People who prefer simplicity but want a more elegant look attached to their outfit would readily veer towards choosing diamonds as their preferred gemstones. Diamonds are beautiful in that under the right light, a flawless diamond makes one look radiant and elegant looking. Another benefit with wearing diamond jewellery is that diamonds gives one a look of utter confidence and an aura of self assurance. Another option that one can also do should diamonds be too much of an expense is to choose gemstone jewelleries. As one's accessories is important in that it reflects the person itself, gemstones such as topaz, rubies or emeralds are ideal as it complement one's outfit without overpowering it. Gemstones are reasonably priced which budget conscious individuals can be capable of purchasing as these are within their means. To look for authentic gemstone jewelleries, remember to choose only specialized jewellery makers or shops that sell authentic jewelleries. These shops offer high quality designer jewelleries that appeals not only to the modern women but also caters to different age groups.